Puerco Asado (Pork Roast) is the dish that symbolizes Christmas, the centerpiece of the Dominican Christmas feast. There are even carols that sing its praises. What you may not be aware of is that this dish has a connection to Tainos, the inhabitants of the Caribbean islands who were living here when Columbus and his fellow explorers first arrived from Europe in the late 15th century. Many words in the Taino’s language have since become household terms all over the world. Words like hammock, tobacco and hurricane and their equivalents in many other languages around the world are derived from Arawak, the language spoken by the Tainos. And every Dominican schoolchild knows that the Tainos prepared casabe, a thin unleavened cassava flatbread that is still made in the traditional way in the region and eaten to this day. The other main image of Taino cuisine is the spit roast, or barabicu, the framework of sticks set upon posts over a fire pit for roasting/broiling/grilling fish and meat. Although the word may have come from the Tainos, they did not invent the actual cooking method. Humans in many parts of the world have been cooking meat in similar ways since prehistoric times. Still, barabicu caught on as an almost universal term, first adopted by the Spanish colonizers as barbacoa. The English transformed it into barbecue, which oddly enough sounds closer to the original Arawak word. As a verb, it means the cooking method (“to barbecue”), while the noun “barbecue” is both the device used for the process and the social event itself. As an adjective, it describes the end product (“barbecued meat”). It’s often abbreviated as “BBQ”, which has given rise to the alternative but less common spelling of “barbeque”. The main animal that the Tainos hunted for meat was the hutía – a smaller species of which survives and is apparently still eaten in Cuba. The Tainos also ate reptiles including snakes, lizards and iguanas and hunted with a breed of dog called the aon. A curious feature of these dogs was that they did not bark. As more Europeans and Africans settled the island, the menu changed with pigs, cows, sheep and goats replacing much of the Taino repertoire. Present-day inhabitants of the Dominican Republic no longer eat hutías, and the meat one sees being roasted on a spit (en puya) is usually pork or goat. Both can be seen along the roadsides throughout the country, and many more stands spring up in the run-up to Christmas when roast pork is traditionally eaten. Many Dominican families do not go to the trouble of roasting their own pig but will buy the meat from one of these stands, a very tangible legacy of the island’s former inhabitants. Puerco Asado Recipe (Pork Roast): This is the main dish in our Christmas and New Year's dinner meals. Nothing like a pernil asado. Carve deep holes in the meat on the opposite side of the skin, parallel to the muscle fiber. Keep a distance of about 3 inches between each hole. Scrub with the lime, getting the juice into the cuts. Mix in all the ingredients for the seasoning in a blender to obtain a coarse paste. Using a teaspoon, stuff the holes with the seasoning mixture, spread the remaining seasoning on the surface (the side opposite to the skin). Let it rest in the fridge for at least 5 hours before cooking (best overnight). Pre-heat the oven to 300°F [150°C]. Place on a roast tray with rack, or else the bottom of the roast will just boil in its own juices. Place skin-side up. If you have a meat thermometer. 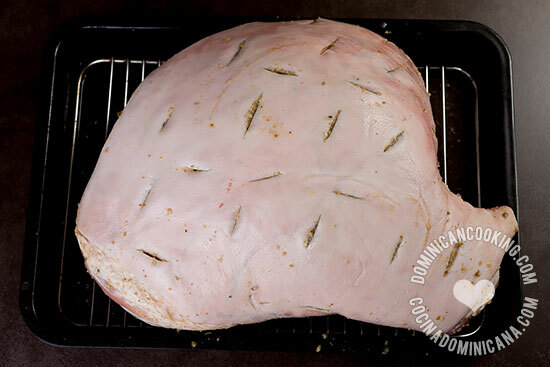 Roast until the thermometer reaches 71 °C [160 °F], start measuring at 3.5 hrs cooking time, with the tip of the thermometer reaching the center of the ham. Cook for 4 hours. Turn around and stab deeply with a carving knife. Check that the meat is not pink and has a uniform color throughout. Return to the oven if necessary and cook for another 30 minutes (always skin side up) before testing again. Repeat as necessary. If you are wondering about the mystery behind this juicy, plump, flavorful dish, look no further than the seasoning that this dish is made with, half dry rub, half marinade. This works in the same manner as brining, only better, as the pockets of seasoning carved into the meat infuses the pork with all its flavors. Please keep in mind the type of oven you have. Convection ovens cook foods 30% faster than regular ovens, so adjust your timing for it if you have one. I strongly advice that you acquire a meat thermometer, as this will guarantee that your pork is cooked safely and to perfection. I am so happy to see this recipe, I can’t wait to try it out. 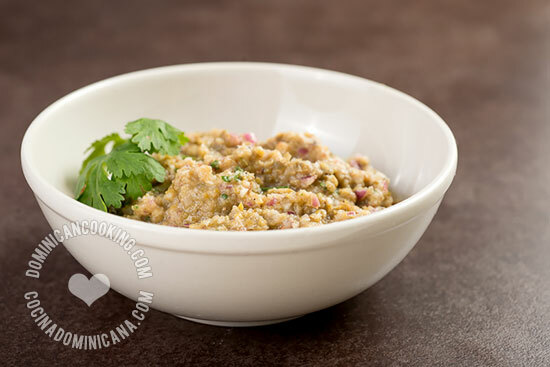 I love your recipes and website, you always bring me back to my Dominican roots. I especially enjoy your anecdotes and history tidbits about our traditional history. Although something I read on today’s post caught my eye. The descriptions of Africans as “settlers” in the Dominican Republic rather than forcefully brough over and enslaved, just did not set well with me. It feels a bit like white washing history, history that is still relevant today. If we look at the definition of the word SETTLERS it means someone who goes to another place to live permanently, the reasons and the way they do it could be many and this word is apropiate used in this post. The actions of a person does not necessarily explain the reasons of such actions. The use of the word SETTLERS here is correct. Thank you. I just wanted to say Thanks!! For this wonderful Pernil recipe. I did it tonight and my friends and family liked it very much. The only thing I omitted was the parsley and replace it with cilantro and added one more lemon. Overall it was delish. Thanks . Do i leave the oven temperature on 300° for the full 3hours? How do I get the skin crispy? Yes, until it reaches the core temperature indicated in the recipe. I am a little confused with the pic’s of the roast pork? It says to slit the non skin side but yet it seems in the pic the skin side is up and slit? Could you please clarify? Thank you and your great website! Could this recipe be used for other meats… For example chicken / turkey. Cooking times will be different.